Chancellor Philip Hammond has mocked prominent Tory Brexiteers for engaging in a “suicide pact” during failed bids to beat Theresa May to the Tory leadership, it has been reported. Government plans for tariff-free movement of goods across the Irish border into Northern Ireland after a no-deal Brexit could be legally challenged, the Environment Secretary has said. Another roller-coaster day in Westminster and what was achieved? Michael Gove drank from a disposable cup in an appearance before MPs while pledging to cut his use of single-use plastics for Lent. Michael Gove has been accused of “classic hypocrisy” after he drank from a plastic cup while pledging to cut his use of single-use plastics for Lent. A no-deal Brexit is the “stuff of nightmares” for British farmers, industry leaders have warned. Michael Gove was heard talking tripe in the Commons as he encouraged people to indulge in “unconventional” food. 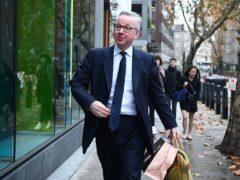 Michael Gove has faced claims the UK Government is guilty of a “feckless and reckless” approach to Brexit and that a no-deal scenario risks “irreparable” harm to the farming industry. Livestock farmers will be compensated if markets collapse in the event of a no-deal Brexit, Environment Secretary, Michael Gove, revealed yesterday when addressing north-east farmers at Keith. A top government minister insisted yesterday Brexit will lead to a revitalised fishing industry in the north-east of Scotland. New Government proposals to toughen food labelling laws to protect allergy sufferers are about saving lives, the father of teenager Natasha Ednan-Laperouse has said. Leaving the European Union without a deal would put at risk “real gains” from Brexit such as boosting productivity in farming and protecting the environment, Michael Gove has said. A pesticide used in slug pellets is to be banned because of the danger it poses to other wildlife, the Government has announced. Drones to monitor wildlife schemes and local advisers to help farmers with issues like welfare should be part of future farm regulation, a review suggests. Cabinet minister Michael Gove has been filmed throwing off the shackles of the government crisis and dancing Gangnam Style with former Labour minister Ed Balls. Farm leaders have hailed the UK Government’s decision to reject plans to reintroduce lynx into the Kielder Forest in Northumberland. The UK Environment Secretary Michael Gove has predicted a “whopper” post-Brexit boost to the nation’s fishing industry, as he vowed never to forget the “last-minute sell-out” of coastal communities in the original common market negotiations. Michael Gove has left Twitter users incredulous after sharing results from an online quiz about TV show Game Of Thrones on his official Twitter account. Scottish Secretary David Mundell has insisted he will not be “bounced into resigning” by “carpetbagger” Cabinet colleagues after a string of ministers quit in protest at Theresa May’s deal. UK Environment Secretary Michael Gove has suggested “forces” in the Holyrood government are playing politics with plans to support farmers post-Brexit. Environment Secretary Michael Gove will today launch a new Fisheries Bill, described as a “major milestone” in delivering the UK Government’s pledge to take back control of British waters after Brexit. A no-deal Brexit could increase the demand for export health certificates by an estimated 150-300%, Michael Gove has said.